The Green Dot Public Schools Tennessee Director of Finance & Operations will support up to 10 schools in Memphis as they are added into the Green Dot network. For the 2015-2106 school year, the Director will be responsible for supporting two existing schools as well as 1-2 new schools for the 2016-2017 school year. He/she will partner with Green Dot’s National Expansion Growth Team, Green Dot National Departments, the Memphis Executive Director, and Home Office team members to set up processes and systems to support the operations and finances of Green Dot Tennessee schools. And why wouldn't Green Dot be confident of big growth opportunities in Memphis, especially since they have an executive, Miska Bibbs, serving their corporate agenda while also serving on the Shelby County School Board. Last year the multi-tasking Ms. Bibbs chaperoned a group of Fairley parents and students to Los Angeles to see Green Dot in action. Photo below. This year Green Dot has taken over Fairley. 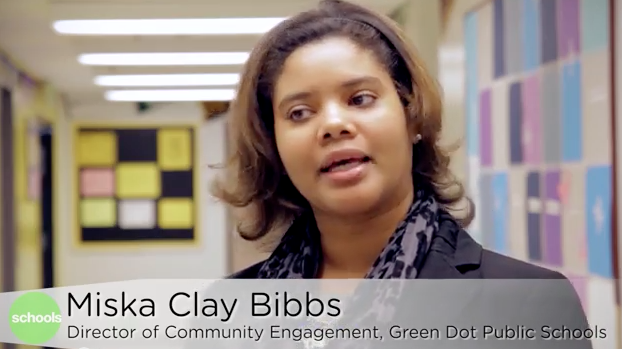 No doubt this will be embarrassing enough that the SCS School Board will insist on Bibbs resigning her Green Dot post. And why shouldn't she? She has already done her job and earned her keep. 1) Change the failed accountability system that has been used since 2002 to verify over and over that where poverty is high, test scores are low. If there were some remedy coming out of this truth that we have known for generations, that would be good. But there is not. h) those charters that impose cultural sterilization and brainwashing techniques that are presented as character training--techniques that no middle class parent would ever allow. 2) Change the way we attempt education reform. Rather than pretending that taxpayers should believe that corporate amateurs can get results that educational professionals cannot, let us move the focus from what happens inside the school building to what happens in our society, which includes the school. Schools, alone, either corporate or public, cannot alleviate the effects of poverty. As the great educator, Jean Anyon said, "Trying to Fix an Urban School without Fixing the Neighborhood in Which It is Embedded is Like Trying to Clean the Air on One Side of a Screen Door." As long as we ignore the poverty, segregation, institutional racism, and lack of cultural, social, and economic opportunities in the communities where we expect miracle schools to defy realities, one lucrative corporate cure will follow another, and the taxpayers will be left holding the bill with nothing to show in return except a deeply eroded democracy and children turned into deracinated robots whose sanctioned exploitation should bring us the shame we surely deserve. The Community Schools Legal Defense Fund of Memphis will be on street corners beginning Tuesday near South Hollywood. Give generously to keep public schools public and to make them better. I see the same thing day after day. Another report on big money's entrance and/or takeover of public education as its alternative using public funding which inevitably leads to diminished budgets to public schools. I'm a product of public education. My generation, as a whole, did very well without testing, VAM, HST, etc. However, until the meme changes to revolt, active nihilism, and extreme uncivil disobedience, the public school groups fighting for their jobs, students, etc., the rentier class will continue to roll in and corporate money will ensure their continued presence and the concomitant diminution of the public commons, public schools, and the segregation of society. I grow tired of the same daily spew. Where is the leadership? It lies within the parents, teachers, some administrators. But mostly it lies within the students. They will be the new active nihilists. Possibly creating another appearance of true liberalism in this country whose wealth is held above all and sent out of the country.